Self-professed cheap-asses, listen up! By joining Kobalt Garage before December 31, 2007, you’ll receive an email voucher for a free 6-in-1 screwdriver. Redeeming this voucher at your local Lowe’s also enters you in Kobalt’s Test Drive and Win Sweepstakes, the grand prize of which is $4,800 in Kobalt Tools and the opportunity to wave the green flag at the Kobalt Tools 500. A word of warning: your local Lowes store may not know about the give away. Mine didn’t. I printed out my voucher, headed to my local store, and tried to redeem it. No employees knew about the contest and they were unable find the 55 screwdrivers their computers said were in stock. I finally found one hiding among the aluminum multi-bit screwdrivers and checked out after 45 minutes. 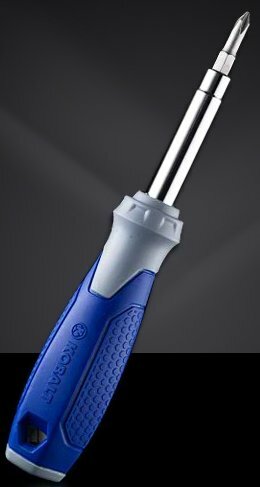 The screwdriver is a standard 6-in1- model with #1 and #2 Phillips, 3/16″ and 1/4″ hex drive, and two different sized slotted bits. The molded rubber handle feels better in your hand than the standard cheap plastic mutli-screwdriver. If you don’t mind trading some personal information for a $4 tool and a chance to win some more tools, this deal is for you. Just be sure to get your screwdriver before your fellow cheap-asses run the local Lowes out of stock. Folks, you may want to first call the 1-800 number on the coupon if your nearest Lowes store is less than a 5 min drive away. I tried to redeem my free driver yesterday but found that all of the Lowes in my zip code were sold out. If you call the 1-800 number, they will offer to enter you into the system for the grand prize, or help you find a store near you which has the screwdrivers in stock. Unfortunately, they have no means to send free drivers by mail. If it’s out of stock, you’re out of luck. I’m all for freebies, but just remember that it’s not worth $5 in gasoline to find out that your local Lowes is out of the $4 drivers. The number to call “if your store’s free screwdrivers are depleted” is 1-866-268-0037. Also, if you cannot find the blue-handled driver, you may be able to redeem the coupon for an aluminum handled one instead. Sorry, the free Kobalt 6-in1 screwdriver vouchers are no longer available. Sorry about that der5er, I had no idea how many cheap-asses there are out there. Ben, it has more to do with greed than being cheap. There’s nothing wrong with wanting a free screwdriver. The problem is that the promotion was posted on deals sites and forums, and greedy people abused the heck out of it. I’m sure there are more than a handful of folk who right now have small stockpiles of screwdrivers which will soon find their way to ebay and craigslist. There is even an ebay entry where some jerk is selling his emailed coupon!! A few weeks back there was a $10 off $25 Lowes coupon signup, and it only lasted only a few hours until it was canned. It was abused so bad that the FTC got involved due to people forging thousands of coupons by manipulating the scan codes via the coupon’s URL. Stuart, You are right. People can be greedy. The guy on ebay is about the worst I’ve seen in a long time. I actually have been meaning to buy a good cheap screwdriver to put into my “around the house” toolbox that I’m putting together so me or my wife don’t have to go out into the garage to grab tools. That and I figured I’d get a little more info for the post. I’ve been that guy at CompUSA. They had a package rebate deal a year or so back, where you could get a Bluetooth earpiece for free, along with all this other stuff for free, if you bought a wireless router. The cheapest router they had was a Zyxel for $5 after a rebate of its own. I wanted to get started playing with Bluetooth, so I scurried around the store, gathering all the required items for the package rebate. It wasn’t until I got home and started reading the rebate forms (printed on 14 feet — I measured — of receipt tape) that I realized I didn’t need all the items to qualify for the deal. The Bluetooth earpiece rebate depended on the purchase of the router. The print server rebate depended on the purchase of the router. The modem rebate depended on the purchase of the router. But they didn’t depend on each other! So without cutting the UPC off the box, I returned the modem the next time I was in the store. That’s one less rebate to hassle with, and no chance of it going “missing” in the mail. The print server, I kept and sent in the rebate for. I didn’t have an immediate use for it, but I could see it coming in handy. Sure enough, ten months later (after all the local CompUSAs closed) I ended up with a $2 used laser printer from Craigslist, and it made sense to put it on the LAN. Voila, free print server! For the cost of a $35 cartridge and a $7 separation pad repair kit, I’ve now got a sweet little network printer that’s done over a thousand pages already. Was that greed? Or just a careful packrat choosing useful stuff to horde while it was cheap and plentiful? Nate, there’s a huge difference between what you did and the lousy folk that abuse such deals. You merely took advantage of a sale and didn’t harm anything in the process. Now, if you ended up going back to the store 50 times, then that’s a different story. It’s okay to take advantage of freebies and deals, and even print out a second coupon for a companion to redeem in your name. But greed comes into play when people either try to profit from a deal, or take advantage of it for the wrong reasons. For example, it’s quite easy to order a free glucose meter for diabetic testing purposes since the companies make money from sellng test strips and other consumables. There are scores of people that order such products “just because it’s free”. Then when they get it, the tester is stuck on a shelf never to be used. Later on, people who coul use the free meters are unable to obtain them since stock is quickly depleted by abusers. Ain’t that a trip, ran home after work to print my voucher and found this” Sorry, the free Kobalt 6-in1 screwdriver vouchers are no longer available”. Damn! Never tried cobalt tools. Are they any good? I’m a Craftmen, Husky, S-K and Snap-on man. Since Im a Toolmonger, I will try them some day. Kobalt is about equivalent to Husky or Craftsman — it’s just Lowe’s vs Home Depot vs Sears. When I read “every single item … free or 99 cents after rebate”, I assumed “one of each item”, since the rebates won’t be valid for more than one. Which is pretty much my behavior. If something looks moderately useful, I’ll take the rebate gamble. Anyway, I wouldn’t put Kobalt or Husky on the same level with Craftsman. I’ve never had to return a broken Kobalt tool to a Lowe’s, but I’ve heard it’s nothing like the no-hassle Craftsman experience. Do you need a receipt like Harbor Freight? Anyone got first-hand stories to share? lowes and home depot USED to be awesome with the exchanges on broken tools. no receipt, no problem… just go to the contractor’s services desk or at worst case customer service. lowes did require a receipt… which printed on thermopaper, they’re un-readable after 6 months. now i don’t bother with lowes anymore. home depot contractor services are still great with tool exchanges, but then again i’m a contractor. don’t know how they are with everyone else. they’ve never asked for a receipt, from me. as far as sears…. every time i’ve been to exchange a broken craftsman tool in the past couple years, it was a complete headache. it too 45 minutes to exchange a damned 1/2″ drive wobbly joint last month. the ratchet, they told me would have to be serviced at a sears service center, no exchange. that’s what the store manager told me over and over. The lifetime warrenty has been gone from some Craftsman tools for a long time now. I know Power tools 20+ years ago were not lifetime. Also torque wrenches and a few others stopped being lifetime several years ago. Sears seems to vary a lot on exchanges. Our Sears is quick and no hassle at all. Go get a new one off the shelf, take it to a register, turn in the broken one and out the door. Other people tell me they had all kinds of hassle at other stores. His friend probably stands in line for toilet paper in Poland. Hey very nice blog!! This was what I needed to know.